A locker policy has been implemented to make best use of the lockers available at the Falls Creek Huette. The next stage in implementing the policy is the introduction of a $10 Locker Fee from 2010. If you have a locker, you can expect an invoice for this fee. To allow the equitable use of the 98 lockers across the membership and to allow the responsible transfer of use of the lockers as a club asset occupying space in the FC Huette. 1 membership debenture will entitle the debenture holder to a request for 1 locker. Lockers will be returned to the club on relinquishing a debenture. Lockers will be transferred with the debenture if the debenture is transferred to a family member. The committee will maintain a register of lockers with Member Names and Debenture Numbers. To be reviewed annually at the Working B and/or the Committee weekend. If a locker is unclaimed then it will be reallocated by the locker sub committee or the full committee. A $50 credit against future locker fees will be attributed to each member holding a locker as at 2000 as per the register held at that time and still a financial member. From calendar year 2010, additional invoices will be sent to each member for the sum of the “Locker Fee” for each locker held. As at 2010 the “Locker Fee” is set at $10 p.a. Review: this policy is subject to Committee review from time to time. The committee has agreed rates for Falls Creek Huette for 2010. As the Treasurer's Report explains, the increase will allow us to start the planned building works. The new Falls Creek rates can be viewed at the www.aacfallscreek.com website. The Club has again performed well from a financial standpoint in 2009.Your Committee has taken the view that if we are to have adequate funding to be able to undertake the substantial redevelopment of the lodge that is required for our Lease renewal, the Club had to be able to operate at a recurrent profit for years in advance of major works being undertaken.To this end the rates for subscription, accommodation, both Winter and Summer including guest rates, must increase a little ahead of inflation in order to ensure that we are able to commence the major project that will include the re securing of our Alpine Lease.Occupancy rates are higher now that the "Blog" has been able to show when rooms are available and our Summer bookings are increasing steadily as Falls Creek increases its attractions in the high Summer period. The Committee is pleased to advise that the Club has again delivered a strong "cash" profit, but this will be reduced as a "reported" profit after capital items and depreciation are deducted. However, our bank balance has increased strongly in the year and broadly speaking we are optimistic about the likely financial position for 2010. Parks Victoria are continuing their programme of fox baiting to protect native fauna, including the mountain pygmy possum. Baits will be laid in the Alpine National Park and some parts of the Alpine Resort area. Of course, dogs are not allowed in the National Park, but anyone with dogs in the area needs to be aware of the risks. Parks Victoria have provided the following information. Baiting will continue through to the 30th June 2010. Foxes may sometimes carry baits to a different location and cache them (store them). These baits are still poisonous. 1080 may remain active in poisoned animals and/or baits for several weeks dependent on prevailing environmental conditions. Your animals may be poisoned if they eat baits or carcasses of poisoned animals. It is unusual for domestic pets to ravage fox carcasses. Steps (eg. muzzling, restraint) need to be taken to ensure that domestic dogs do not gain access to 1080 pest animal baits or poisoned animals. Closely monitor the health and behaviour of your domestic pets. If you notice any unusual or uncharacteristic behaviour contact your local veterinarian immediately. Do not disturb sand mounds or bait stations. 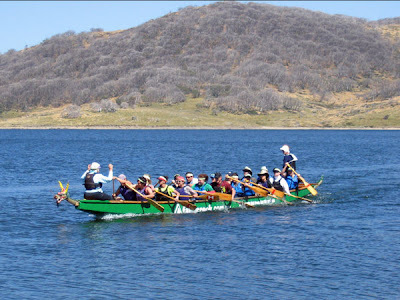 Dragon boat racing has been an important summer event at Falls Creek for a few years. It is a fund raiser and awareness raiser for the Cancer Council, as well as being a fun weekend. There are 6 titles up for grabs including the Club Lodge Challenge, Corporate Challenge and Women's Challenge. If you are interested in an AAC Falls Creek team please reply to aacfallscreek(at)gmail.com You can also download an entry form and more information from Falls Creek website. Booking numbers for winter 2009 have been tallied and analysed. 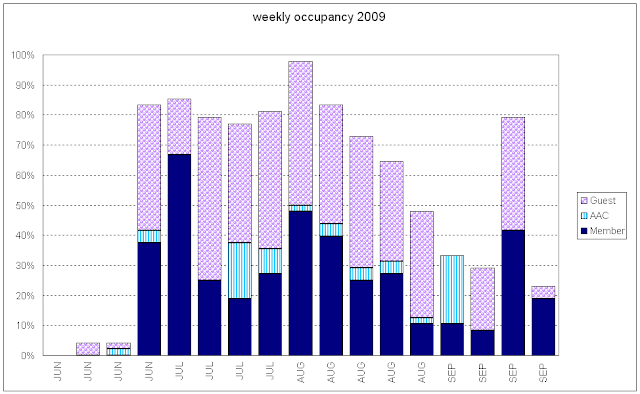 This chart shows the weekly occupancy rates during the winter season. Weekends often pushed occupancy higher.